Though numerous readers will have just come to know the name Marcel Sternberger, many of you have carried one of his images. A portrait of Franklin Delano Roosevelt taken by Marcel was the basis for the American dime. This marks Sternberger as one of the great photographers of the last century, but it also makes him as prolific as any artist in history. How the art of a refugee from the Second World War came to live in America’s pockets is an amazing story. You will find it on this website and in more depth in the book The Psychological Portrait: Marcel Sternberger’s Revelations in Photography being offered for sale. Marcel Sternberger began his life in 1899 as a citizen of the Austro-Hungarian Empire and served in World War One as an intelligence officer. During the years that followed, his country saw the rise of communism and then fascism, and neither were good for Marcel and his family. In the late 1920’s, he fled Austria-Hungary for France. There he began his career as a journalist. He would go on to write for Le Soir and Le Soir Illustré. When he later became a photographer, he brought to his work his journalistic instincts, turning every portrait session into an interview documented with his hand held Leica. He soon moved from Paris to Germany, where, in 1932, he met his future wife Ilse, at the time a film student. It was actually Ilse’s love of film that would translate into a career as a photographer for Marcel. Indeed she gave him his first camera, a Leica, as a wedding gift. After they were engaged, Sternberger travelled back to France. Their wedding was planned for June of 1932, but Marcel learned through his journalistic contacts that the Nazis planned on confiscating the passports of Jews to prevent them from leaving Germany. He returned to Berlin and the couple was married in April. The day after their wedding they were detained by the Gestapo and questioned; after being released they quickly fled to Paris, where Marcel began his forays into photography. Shortly thereafter, the couple fled further to Antwerp. His professional life as a portrait photographer began when he was commissioned in 1935 to photograph the Belgian royal family and then named their Official Photographer. Marcel found almost immediate success in portrait photography. In addition to his journalistic training, Marcel brought to his portrait sessions his knowledge of the psychology of portrait photography, a new interdisciplinary field of inquiry of which he was one of the leading proponents and practitioners. Marcel believed that only by gaining insight into a person, through knowledge of their history and personality, could a revealing and authentic portrait be created by the photographer. Using a keen sense of interpersonal psychology to maneuver the subject and session toward desired moments, he then captured them forever with his camera. Whether insecure or overly bold, comfortable with the camera or more recalcitrant, each subject brought to the portrait session specific psychological traits that Sternberger analyzed, adapting his psychological methodology to create the memorable and beautiful portraits of both famous and everyday people you will find on this site and to a greater degree in The Psychological Portrait. The circumstances of World War II left Marcel an international citizen; he spoke fourteen languages and moved between more than ten countries over the course of his career. In 1939 the Sternbergers, with two children, fled to England to escape Nazism’s growing reach. There, his first subject of note was the novelist Stefan Zweig, a prolific and popular author one of whose works was recently made into the film The Grand Budapest Hotel. Marcel also photographed H.G. Wells and A.J. Cronin as well as Pearl S. Buck, three other well-known writers. Next to appear in front of Sternberger’s lens was George Bernard Shaw. Shaw was an author, dramatist, composer of music, and the co-founder of the London School of Economics. Sternberger then photographed Sigmund Freud. Freud was terminally ill with jaw cancer and his session with Sternberger would be his last portrait sitting. The photographs are as technically accomplished as any produced at the time. One of them was used on the cover of Freud’s last book, Moses and Monotheism. Sternberger’s professional life relied on the recommendations of those he had photographed. It was upon such a recommendation by Joseph Kennedy that Marcel came to the United States to photograph President Franklin Delano Roosevelt at the White House. This quotation displays one of the essential aspects of Marcel’s work, the establishment of rapport with his sitters. Indeed, before their shoot Shih and Marcel not only spoke at length, but Dr. Shih played Sternberger records of Chinese folk music that his mother had sung to him as a child. It was this sort of intimate interpersonal relationship that provided the fertile ground on which Sternberger based his portrait sessions. 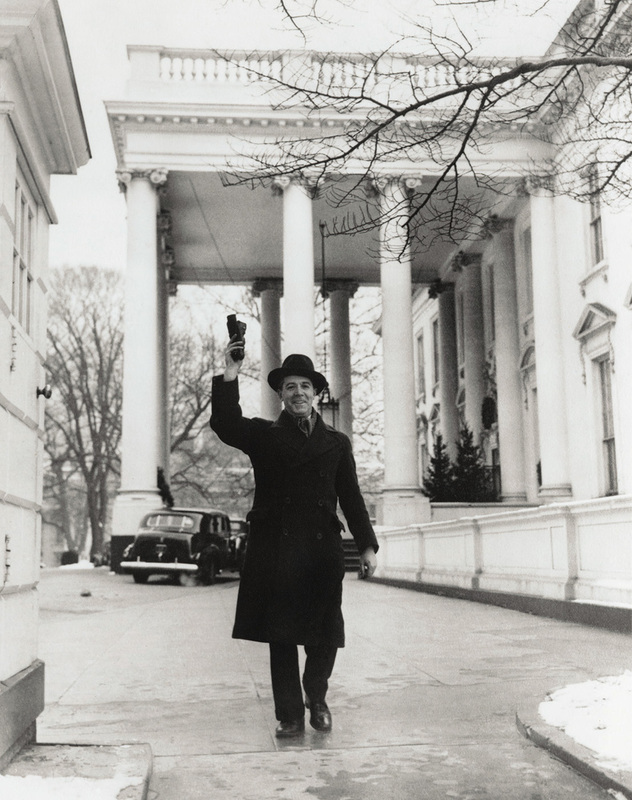 While in Washington, Marcel photographed a variety of other diplomats, senators, and political notables. He soon brought his family to America and they settled in New York City. Here Sternberger began a private photography practice in Far Rockaway, as well as teaching at NYU. In 1950 he travelled to Princeton, New Jersey and photographed Albert Einstein in his home. The two had met before in Europe and would later correspond. Few people have come to know so intimately such a wide variety of luminary personalities. Part of this intimacy came from spending time in their homes and conversing with them on a wide range of topics. 1950 was also the year that Sternberger photographed the first Prime Minister of India Jawaharlal Nehru and his highly influential daughter Indira Gandhi on their trip to the first meeting of the United Nations. One of Sternberger’s portraits of Nehru was used as his official government portrait as well as on the cover of his book Glimpses of World History. The picture could be found in every school and government building in India and in embassies abroad. While living in New York City, the Sternbergers travelled to Mexico to photograph Miguel Aleman, Mexico’s president. After this official presidential session they ironically became intimate friends of the communist radicals and artists Diego Rivera and Frida Kahlo. Sternberger would go on to produce some of his finest work photographing Rivera. Tragically, in 1956, while travelling back from New York to visit his artistic friends in Mexico, Marcel Sternberger died in a car crash in Christiansburg, Virginia. It was due to this tragic accident that his work slipped into obscurity. After his death Marcel Sternberger went from a well-known artist featured in radio broadcasts across the nation and known to some of the most powerful people in the world to an unknown and forgotten portraitist. Although he had been the first photographer whose photographs were exhibited at a one-man show, at the Chicago Art Institute, his work would quickly fade from public view. This website and The Psychological Portrait begin to rectify that unfortunate state of affairs and bring Marcel’s genius back into public view where it can be appreciated and enjoyed.